Fast moving water with riffles and small waves. Swimming is pleasant, shore easily reached. A nice break from paddling. Almost all gear and equipment is recovered. Boat is just slightly scratched. Straightforward rapids with wide, clear channels which are evident without scouting. Swimming to eddies requires moderate effort. Climbing out of river may involve slippery rocks and shrub-induced lacerations. Paddle travels great distance downstream requiring lengthy walk. Something unimportant is missing. Boat hits submerged rock leaving visible dent on frame or new gash in plastic. Rapids with moderate, irregular waves which may be difficult to avoid. Water is swallowed. Legs are ground repeatedly against sharp, pointy rocks. Several eddies are missed while swimming. Difficult decision to stay with boat results in moment of terror when swimmer realizes they are downstream of boat. Paddle is recirculated in small hole way upstream. All personal possessions are removed from boat and floated in different directions. Paddling partners run along river bank shouting helpful instructions. Boat is munched against large boulder hard enough to leave series of deep gouges. Sunglasses fall off. Water is generally lots colder than Class III. 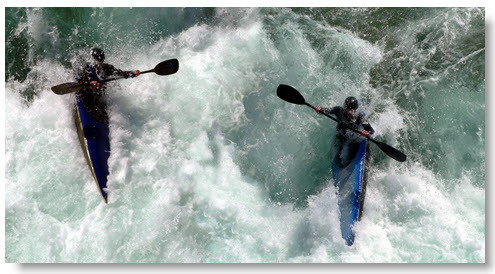 Intense, powerful but predictable rapids requiring precise swimming in turbulent water. Swimming may require “must make” moves above dangerous hazards. “Must make” moves are downgraded to “strongly recommended” after they are missed. Sensation of disbelief experienced while about to swim large drops. Frantic swimming towards shore is alternated with frantic swimming away from shore to avoid strainers. Rocks are clung to with death grip. Paddle is completely forgotten. One shoe is removed. Hydraulic pressure permanently removes waterproof box with all the really important stuff. Paddle partners running along stream look genuinely concerned while lofting throw ropes 20 feet behind swimmer. Paddle partners stare slack-jawed and point in amazement at boat which is finally pinned by major feature. Climbing up river bank involves inverted tree. One of those spring loaded pins that attaches watch to wristband is missing. Contact lenses are moved to rear of eyeballs. The water in this rapid is usually under 42 degrees F. Most gear is destroyed on rocks within minutes if not seconds. If the boat survives, it is in need of about three days of repair. There is no swimming, only frantic movements to keep from becoming one with the rocks and to get a breath from time to time. Terror and panic set in as you realize your paddle partners don’t have a chance in heck of reaching you. You come to a true understanding of the terms maytagging and pinballing. That hole that looked like nothing when scouted, has a hydraulic that holds you under the water until your lungs are close to bursting. You come out only to realize you still have 75% of the rapid left to swim. Swim to the eddy? What #%^&*#* eddy!? This rapid usually lasts a mile or more. Hydraulic pressure within the first few seconds removes everything that can come off your body. This includes gloves, shoes, neoprene socks, sunglasses, hats, and clothing. The rocks take care of your fingers, toes, and ears. That $900.00 dry suit, well it might hold up to the rocks. Your paddle is trash. If there is a strainer, well, just hope it is old and rotten so it breaks. Paddle partners on shore are frantically trying to run and keep up with you. Their horror is reflected in their faces as they stare at how you are being tossed around! They are hoping to remember how to do CPR. They also really hope the cooler with the beer is still intact. They are going to need a cold one by the time you get out! Climbing out of this happens after the rapid is over. You will probably need the help of a backboard, cervical collar and Z-rig. Even though you have broken bones, lacerations, puncture wounds, missing digits & ears, and a concussion, you won’t feel much pain because you will have severe hypothermia. Enjoy your stay in the hospital: with the time you take recovering, you won’t get another vacation for 3 years.